The quarter-final draw of the Techflow Group Northumberland Senior Cup has thrown up four mouth-watering ties. 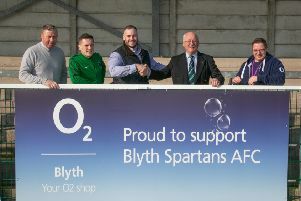 Holders Blyth Spartans have landed a plum home tie against Newcastle United Reserves whilst Whitley Bay, who recently enjoyed a good run in the FA Cup, will host an in-form Morpeth Town side pushing for the Ebac Northern League first division championship. FA Vase holders North Shields entertain Steve Harmison’s Ashington at the Daren Persson Stadium and Bedlington Terriers have home advantage against Northern League second division side Heaton Stannington. The draw reads: Bedlington Terriers v Heaton Stannington; Blyth Spartans v Newcastle United Reserves; North Shields v Ashington; Whitley Bay v Morpeth Town.